This single serve coffee maker comes with a 7 ounce ceramic coffee cup. You can also fit Styrofoam cups into the coffee maker. Comes with a coffee filter, but seems like you cannot find a perfect fitting paper filter. You can make your own to fit, but so far nobody knows where to purchase a replacement filter. 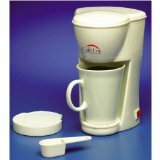 But this coffee maker makes some of the best tasting coffee at a very reasonable price. It is also small enough to pack to bring along on trips. Works great when you want coffee in your motel room, and the motel/hotel doesn't have any coffee, or you just like staying in your room and making it. This personal size brewer brews directly into your favorite coffee cup or mug. Will accommodate a wide variety of mug sizes. You get an illuminated on/off switch, a permanent filter, and it comes with a coffee mug. Also good for tea as it dispenses hot water. Comes with a two year limited warranty. Single serve coffee pod coffee maker includes 18 Senseo coffee pods. It makes coffee very fast and brews up to 12 ounces. You can pick from a wide variety of coffee blends and flavors including decaf and regular, teas, and hot cocoa. The brew basket is dishwasher safe. This one cup coffee maker brews a quick cup of coffee. It will brew directly into your cup or mug. Comes with a permanent filter, illuminated on/off switch, water level indicator, and a 10 ounce ceramic mug. Includes a two year limited warranty.